The crew of the liveaboard diveboat Okeanos Aggressor welcomes you aboard as you embark on what will be an exciting and truly memorable journey to remote Cocos Island where you will thrill to big animals and equally big action. 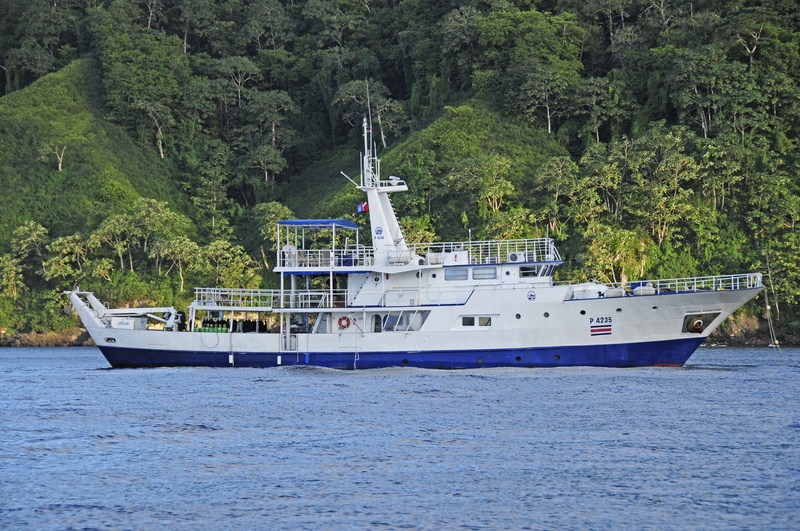 Enjoy the best scuba diving Cocos Island has to offer as well as excellent accommodations and delicious meals while onboard the Okeanos Aggressor, described as a floating dive resort. The 10-day charters depart from the port town of Puntarenas, on the west coast of Costa Rica. You will leave on a Tuesday, make the voyage to Cocos, enjoy seven full days of diving starting on Thursday, and then return to the mainland the following Friday. Cocos Island, home to the famous Cocos Island Marine Park, is located approximately 300 miles (483 km.) southwest of Costa Rica. Designated a World Heritage Site, famed oceanographer Jacques Cousteau considered Cocos Island “the most beautiful island in the world”. This uninhabited island is approximately five miles long by two miles wide (eight by three km. ), and has been known to be a favorite stop for sailors, pirates, and numerous other expeditions in search of legendary hidden treasures. The island is characterized by its rugged coastline and countless waterfalls. The trip from Puntarenas to Cocos Island takes approximately 32 hours. On this voyage you are likely to sight whales and dolphins along the way. It is recommended that you take precautions for motion sickness during this time as well as on the return at the end of the trip. Because of the currents and the ruggedness of Cocos Island, beginning divers may find scuba diving here somewhat difficult. This trip is not recommended for newly-certified or handicapped divers. Before making your first dive, you will be required to present your c-card or proof of diving certification to the divemaster. The average water temperature ranges between 72°F and 82°F (22.2°-27.7°C) with cool thermoclines. It is therefore recommended that you use a 3-5mm. wetsuit or shorty year round, as you may want to make as many as 3-4 dives each day and an optional night dive. The average annual surface temperature is 74.5°F (23.6°C), but it can be rainy and cool at night. Scuba diving in the waters surrounding Cocos Island is nothing short of spectacular. Photo and video opportunities abound at every dive site. Throughout the week you will dive from the boat’s tenders. Large pelagics are the main attraction. The waters around Cocos Island are replete with marine giants: Schooling Hammerheads, Mantas, Bottlenose Dolphins, Whale Sharks, Marble Rays, Marlin, Turtles, and White-tipped Sharks are only the beginning. At Cocos Island the bottom of the ocean floor is comprised of volcanic rock. When scuba diving at Cocos Island, it is highly recommended that you use Nitrox. Visibility is between 80 and 100 feet (24-30 m.), and most of the action takes place between 50 to 100 feet (15-30 m.). Dive sites are selected by the Okeanos Aggressor’s captain and may vary due to weather conditions and the boat’s location. With its abundant sea life, scuba diving at Alcyone is considered one of Cocos’ signature dives. On one of his trips, Jacques Cousteau discovered this underwater plateau which is home to a variety of sharks. Everywhere you look you will see White- and Black-tipped Sharks, Whale Sharks, Mantas, Silky Sharks, and hundreds of schooling Hammerhead Sharks. Guests aboard the Okeanos Aggressor consistently note Dirty Rock as one of their favorite dive sites, perhaps because of the hundreds of Marble Rays and tremendous schools of Jacks that can be seen here. Imagine your thrill when you swim right through one of the schools! Whale Sharks are often spotted here as well. Dirty Rock, with dive depths of 20-130 feet (6-40 m.) is an impressive, exciting dive. At the southern part of Cocos Island lie two of its most famous dive sites: Dos Amigos Grande and Dos Amigos Pequeña. The huge arch located at Dos Amigos Grande is big enough for an entire dive group to swim through it at the same time. Typical scenes at this memorable dive site include schooling Hammerheads, mating or feeding Eagle Rays, and Marble Rays friendly enough to come swim among the divers. At Dos Amigos Pequeña you will see Manta Rays, Galapagos Sharks, Silky Sharks, and enormous Yellow Fin Tuna swimming through the depths of the open sea. Manuelita offers divers a magical dive experience. This one site offers a variety of encounters, and is equally spectacular whether you dive during the day or at night. You can come face-to-face with schools of Hammerhead at their cleaning station. During night dives White-tipped Sharks make an appearance in the shallows. The waters are replete with Jacks and schools of Snappers. Find a hiding place where you can station yourself as you will not want to miss a minute of the action. During your week at Cocos, if conditions permit, passengers may wish to visit the island to enjoy a hike through the tropical forest or a swim in the cool waters of one of the island’s many waterfalls. The Aggressor Fleet strives to provide scuba divers and vacationers with the highest quality, most memorable and innovative liveaboard experience possible. Their dive boats afford guests both safety and comfort as they travel to the best diving locations around the world.